Announcing the Real Vancouver Writers’ Series! and the Shebeen Club is a proud media sponsor thereof! There; one doesn’t get the chance to use the word “thereof” nearly enof. See what I did there? You can download and print this poster by right-clicking the poster link and saving to your computer. Pass it around, post it up, wear it as a loincloth; knock yourself out! 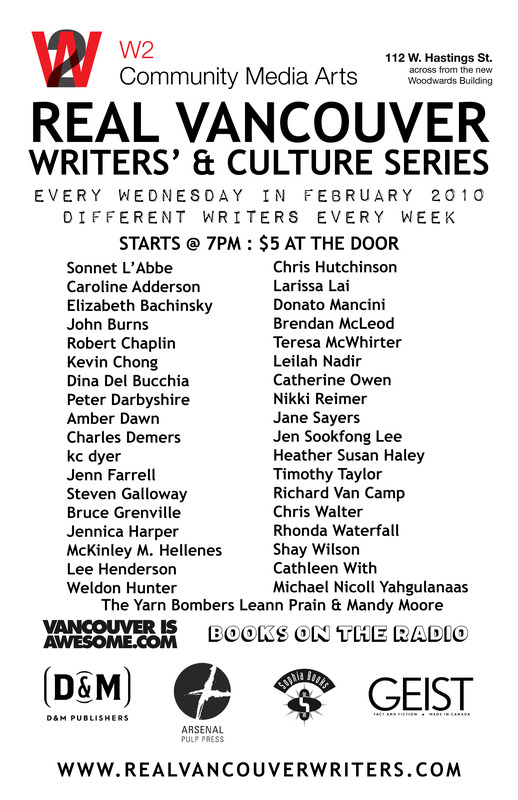 Wednesdays just got a little more literate in Vangroover, as Sean Cranbury of Books on the Radio organizes a new literacious salon every Wednesday in February: the Real Vancouver Writers’ Series. Save time: put it in your calendar now and avoid guilt-ridden “I shoulda’s” later. You can see the entire lineup for the full month on the website, and it’s extremely highly bitchin, to say the least (which is never my first choice; I’ve never gotten over getting paid by the word. As you can tell). The Real Vancouver Writers Series consists of 4 weekly events showcasing local Vancouver writers, publishers and creative literary artists at the W2 Culture + Media House. These evenings are designed to show the city and the world real and diverse Vancouver culture and real creative individuals in the literary and publishing communities at a time when the eyes of the world are on our city. Countless millions of people will want to know what real Vancouver culture looks like. We are determined to take the opportunity to show the world just how amazing, diverse, talented and fun our literary and publishing culture is! These events will occur every Wednesday during February beginning at 7pm. Every night will consist of writers that will give the in-house audience a glimpse of the variety of cultures, ethnicities, forms and skills of writers living and working in Vancouver. It will showcase the writers, their books, their publishers and other support structures within the local community and the larger culture and publishing communities. This entry was posted in Authors, BC, Books, Canada, Conferences Unconferences Festivals Retreats, Downtown Eastside, Events, Literary, Media, Poetry, Real Vancouver Writers' Series, Salon, Shebeen Club, Vancouver, Writing. Bookmark the permalink. So are you saying only real writers drink whiskey? Are you kidding? The only real writer I know who can afford whiskey is William Gibson, and I don’t think he drinks it anymore.